Every few weeks I like to sit down and praise my children under the guise of giving them parental advice to take with them as they grow older. Every once in a while the words that come out of my keyboard are a little more pointed and directed at their stumblings rather than their wins. Today is one of those days. The morning started off innocent enough. 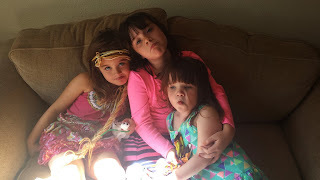 The girls woke me up in what they perceive to be the wake-up they receive on school mornings. It consisted of stuffed animals threatening to eat my face if I din't get up. Pretty high-brow stuff. From there I let them know that I would make some French toast with an awesome caramel apple syrup that I make. I asked that they clean a couple of rooms that they had destroyed the night before and that breakfast would be ready when they were done. Easy enough I thought. Best laid plans of mice and men. While making a feast of a Sunday breakfast, the girls were quiet, cleaning I assumed. What I found in my middle child's room was off-putting to say the least. Instead of cleaning, the girls decided to see how much stuff they owned by putting it in the middle of the room, or at least that is what I surmised. While my blood pressure spiked and I asked for answers I was given a lot of shoulder shrugs and "I don't knows". The morning continued like that through breakfast and until lunch. Most parenting books urged me to ignore my impulses to shake them silly or withhold food and holidays. So instead, I just lost my mind and my cool and made idol threats. Eventually, the work got done. The house is presentable and my heart rate has returned to that of a rabid squirrel. The lesson is this, it doesn't have to be that way. Sometimes it is better to act preemptively. Clean without being asked. Do homework without the need for the riot act. Practice soccer without having to be bribed. I think that you'll find that you'll be happier without the yelling and the begging. I remember my mother saying that she is not our servant. Imagine my surprise as the same words fell out of my head. Girls, there is some truth to that. It's easy to fall in a rut where mom and dad pick up every dish, every stitch of laundry and remind of every homework assignment. But here's the thing, you'll enjoy it a lot more if you do it yourself. Beyond the quieter tone of dad, there is also the fact that completing things on your own feels good. Doing things for someone else feels good. Let's try it a little more often so you can know that I'm right....per usual.